FREE APPRAISAL. To buy, auction, sell or consign your Uncle Tom’s Cabin first edition that is for sale, please email Nate@NateDSanders.com or call the Nate D. Sanders Auctions (http://www.NateDSanders.com) office at (310) 440-2982. Top dollar obtained for your Uncle Tom’s Cabin first edition. “Uncle Tom’s Cabin” was the 19th century’s best-selling novel and had a part in starting the Civil War. 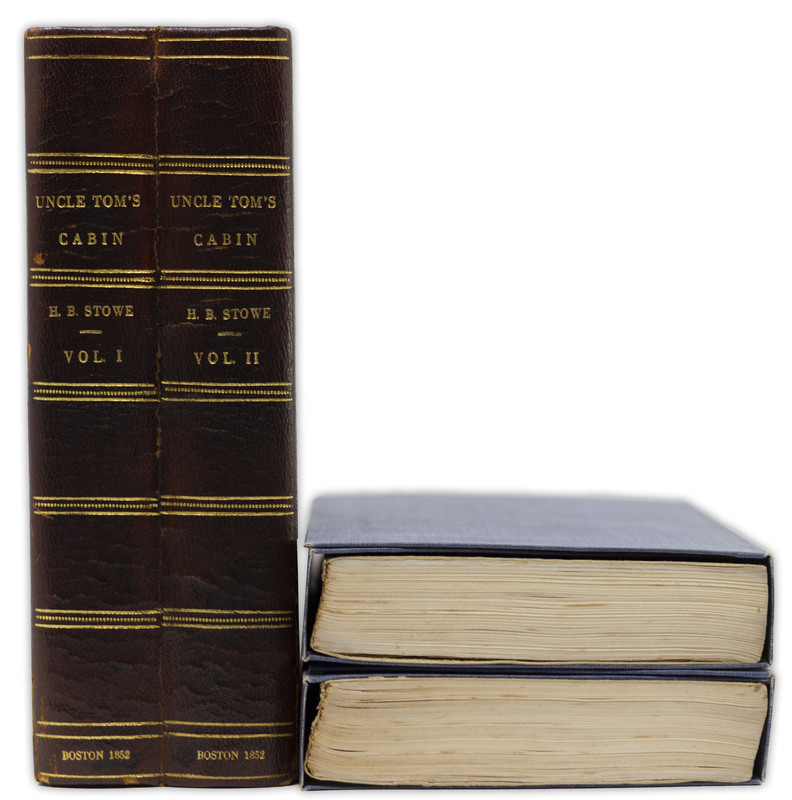 We are auctioning a First Edition, First Printing of ”Uncle Tom’s Cabin” by Harriet Beecher Stowe in our January 2019 auction. Bidding begins at $20,000. 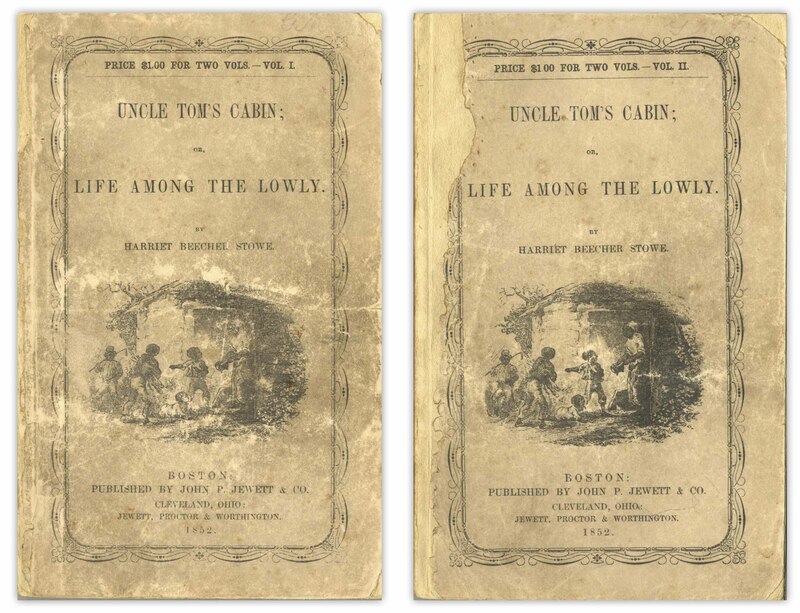 First Edition, First Printing of ”Uncle Tom’s Cabin” by Harriet Beecher Stowe — The Scarcest Variant of the First Printing, in Publisher’s Wrappers. Click to enlarge. Extraordinarily scarce first edition, first printing of Harriet Beecher Stowe’s ”Uncle Tom’s Cabin”, in the publisher’s wrappers binding ”A”, the rarest of the three variants of the first printing. Boston: John P. Jewett, 1852. Two volumes, as issued, with three plates in each volume by Hammett Billings, priced at $1.00 for both volumes. All other first printing points are present: ”spilt” instead of ”spiled” on page 42, line 1 of Vol. I; ”cathecism” instead of ”catechism” on page 74, line 5 of Vol. II; no attribution to Billings for the engravings; no other printings designated on the title page of either volume; with the following statements on the copyright page: ”Entered according to Act of Congress, in the year 1851, by Harriet Beecher Stowe” and ”Stereotyped by Hobart & Robbins”. Volumes measure 4.625” x 7.375” housed in blue clamshell cases and a custom slipcase. With provenance from famed dermatologist and collector Paul E. Bechet, with his library labels, causing shadowing to title pages. Spines of both volumes repaired, with some paper loss, more so on Vol. II with that back cover replaced. Light toning, wear and soiling. Overall a very good set. FREE APPRAISAL. 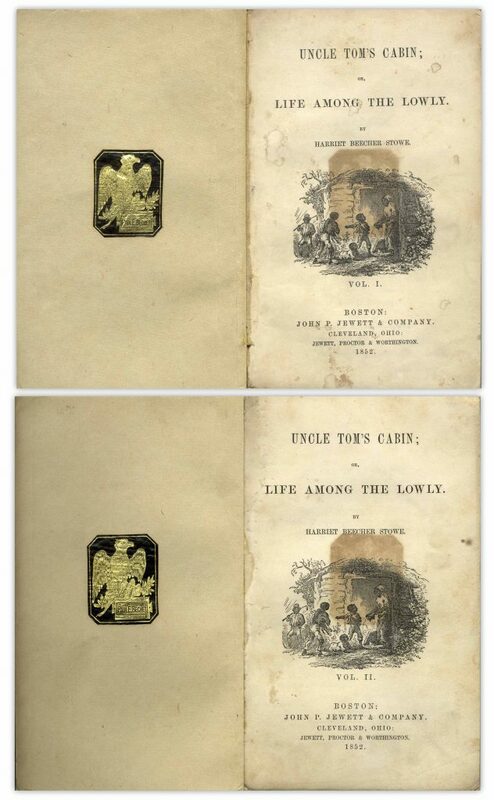 To buy, auction, sell or consign your Uncle Tom’s Cabin first edition that is for sale, please email Nate@NateDSanders.com or call the Nate D. Sanders Auctions (http://www.NateDSanders.com) office at (310) 440-2982.